Law courts are globally presumed to be temples of justice where impartial judgements are dispensed. The least that could ever be expected from any government is to deliberately resort to using the instrumentality of law to discredit and blackmail perceived political opponents, as well as dissenting voices. News broke out early this year that Justice Walter, who has now been suspended as the Chief Justice of the Federation failed to declare his assets and maintains bank accounts in foreign currencies and equally made efforts to obstruct the course of justice. The Nigerian media space and particularly the social media were a washed with allegations that Onnoghen had 55 undeclared buildings as well as millions in local and foreign currencies. The quantum of opprobrium and vilifications vented on the person of Justice Onnoghen by majority of Nigerians was enough to have caused a deeply emotional trauma for any being. At the speed of light, the man was sadly suspended, replaced with Justice Ibrahim Tanko Muhammad and arraigned at the Code of Conduct Tribunal with the expectations that a truck load of damning evidence would be brought before the Tribunal. In the course of the trial, the undeclared 55 buildings and millions of dollars and pounds alleged to be in the five accounts of Justice Onnoghen suddenly disappeared into the thin air. Surprisingly, the bank Relationship Manager where the five accounts of Onnoghen are domiciled told the Code of Conduct Tribunal that the man is still servicing a loan facility of $500,000 which he obtained with his investment in bonds and other investment. The witness further disclosed that as at December 2018, balance in one of the naira accounts of Justice Onnoghen was N2.6million while the other was N12.8million. She also revealed that the balance of his euro account as at December 2018 was €10,187, while the pounds Sterling accounts as at December 2018 had a balance of 13,730 pounds and the dollar account as at January 2019 was $56, 878. The banker also informed the court that Onnoghen never operated a foreign account as the five accounts were naira and domiciliary accounts. Prosecution team of the federal government was too embarrassed and had no other choice than to hurriedly close its case after calling only three out of the six witnesses earlier lined up. On the other hand, the defence team of Justice Onnoghen immediately filed a no case submission having come to the realization that the charges against the innocent man had fell like a pack of cards. It is quite saddening that a patriotic Nigerian like Justice Walter Onnoghen could be wickedly subjected to unpatriotic judicial witch hunt all in the name of political expediency. 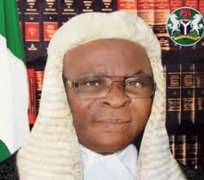 It is rather unfortunate that Onnoghen is not alone in the evolving judicial persecution of innocent Nigerians. The Senate President, Dr. Bukola Saraki was made to go through the same tortuous and frustrating phantom trial at the Code of Conduct Tribunal. At the end of the agonising trial that went up to the Supreme Court, a five -man panel of the apex court led by Justice Dattijo Muhammad unanimously upheld the appeal of Saraki and dismissed the remnant three counts charge preferred against the Senate President. As a matter of fact, both the Code of Conduct Tribunal which initially dismissed all the charges against Saraki and the Supreme Court declared that the evidence led by the prosecution was entirely hearsay. N750m from the then National Security Adviser, Col. Dasuki 'for doing nothing'. Whereas, such a huge figure was never mentioned when Okupe was arraigned in court. No lie can be more wicked than this! Contrary to the claim of EFCC, Okupe was only getting N10m on a monthly basis which was later reduced to N5m. This monthly subventions were intended to be used to run the newly created office of The Special Assistant to the President on Public Affairs. Out of this monthly subventions released to Okupe from office of the NSA, he made the under listed payments: salaries of 23 staff, newspaper publications and adverts, press conferences, research on public perception polls, sponsored weekly programmes on television and radio, travels amongst other a tivities. It is without doubt that someone like Okupe is only being harassed with EFCC and the court for belonging to the opposition party. Although, no seer is needed to foretell that Okupe will at the end triumph in the court of law like Saraki, Onnoghen and others. The judicial witch hunt of Activist Deji Adeyanju was wickedly taken to the level of imprisonment. The young man was made to languish in Kano prison for an exhumed alleged offence he was said to have committed almost a decade ago, for which he had been acquitted and discharged by a federal High court. The three months he was compelled to spend in prison custody smacked off an orchestrated plan in connivance with the judge to keep the young man out circulation for the period of electioneering campaigns. The list of Nigerians being persecuted in various courts across the country is endless. But the consolation is that the same court of law did not allow the wicked to serve the dual roles of prosecution and judge in his own case. Those that have resorted to judicial persecution of innocent Nigerians on the ground of their political leaning and dissenting views ought to know that the beauty of democracy lies with vibrant opposition. President Muhammadu Buhari is expected to patriotically rise above partisan sentiments by ensuring that those behind the humiliating and wicked persecution of innocent Nigerians are deservedly punished. President Buhari is particularly urged to make scape goats out of those that wove unconscionable lies against Justice Onnoghen. The least the innocent man deserves at this time is immediate lifting of his suspension from office as the Chief Justice of the federation as well as public apology. It must be realized that no nation in the world that aspires to be great can ever attain greatness by resorting to unconscionable persecution of her patriotic citizens on phoney charges. Disclaimer: "The views/contents expressed in this article are the sole responsibility of Kehinde Adewole and do not necessarily reflect those of The Nigerian Voice. The Nigerian Voice will not be responsible or liable for any inaccurate or incorrect statements contained in this article."